We are in bridal season glory and we couldn’t be happier. However, we have our eyes set on a very important aspect of the bride and that’s her gorgeous locks. After all, when you are walking down the aisle you want to look beautiful from head to toe. This year we are looking at a more modern take on bridal hair trends. 2016 has been the year of the contemporary modern bride when it came to fashion and bridal hairstyles is no exception. From veil alternatives to fun pieces and more low key looks this year’s hair trends feel more energetic and revamped. 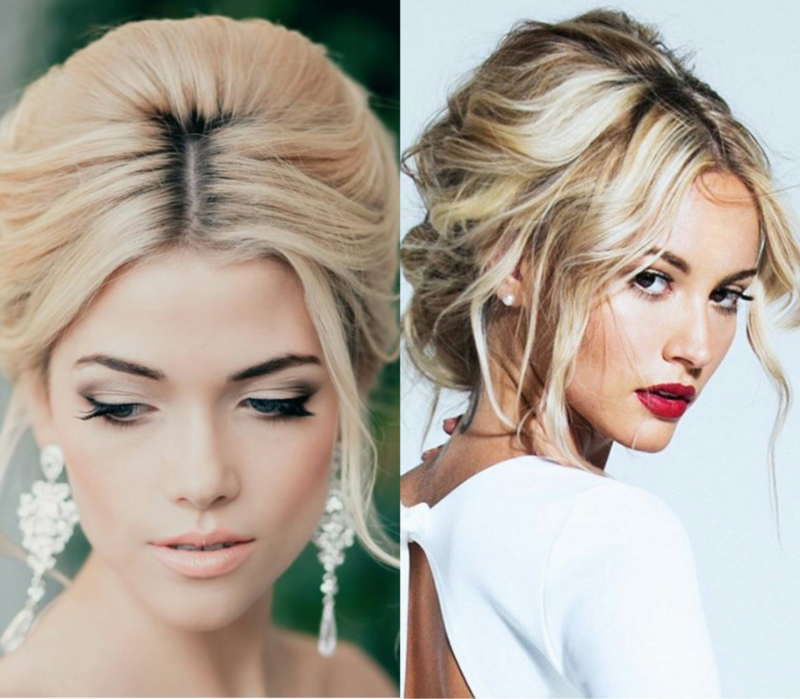 Here are 8 bridal hair trends that every bride will want to try this 2016. The 2016 the name of the hair game is low key. We are looking at hairstyles that are more low key than we have ever seen them before. This year brides have opted for pony tails as their bridal hair. The reason being pony tails are easy and fun to wear while they can be dressed up or down for whatever theme your wedding may be. They can be worn down low, up high or even to the side. However, if a ponytail seems too casual for you, you can always add flowers, braids or even hair accessories to dress it up. By now middle parts have established themselves as being part of those trends that is back with a vengeance. Long gone are the days when you tried to avoid a middle parting your hair instead now you want to have a middle part to be on trend. Influencers such as super model Kendall Jenner have been seen sporting a middle part at different events. The best part about the middle part is that it can be worn with multiple looks. You can wear it with a ponytail, a bun or even with your hair in waves. The options are endless. If you want to dress it up, you can always go for a classic updo and just change-up the parting in your hair. While waves and curls have traditionally been a bridal go to look. We are now looking at an upgrade for this do. While it has always been customary for brides to have curls in their hair for their special day it has always been a tighter curl. 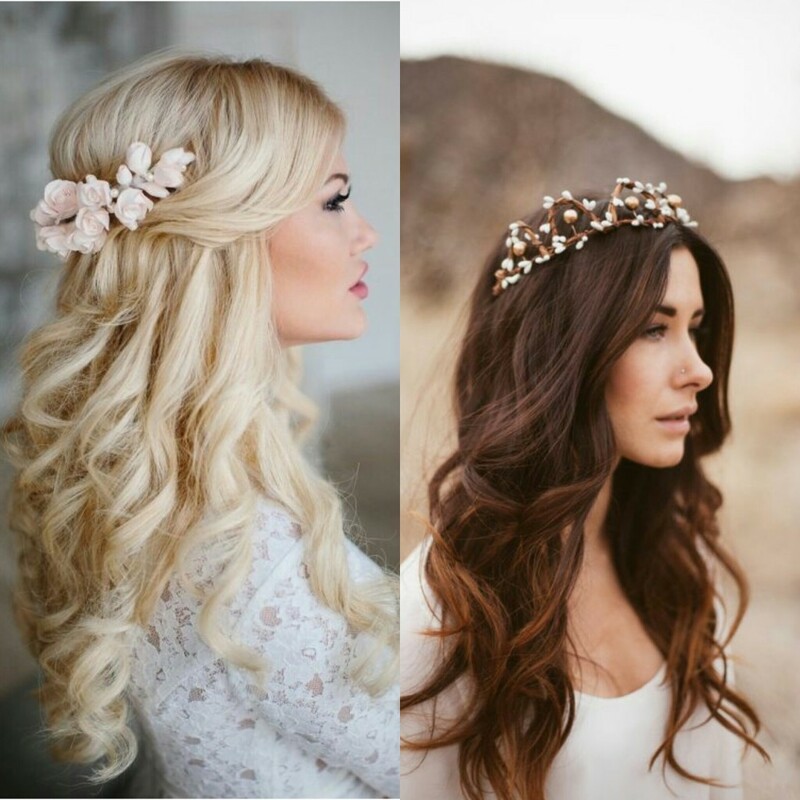 This 2016 we are expecting to see loose waves as the most popular bridal hairstyle. Not only will we see loose waves as one of the hottest bridal hairstyle trends but we will see it in different shapes and styles. The loose waves style will be in updos, with headbands, or flowers even incorporated in braids. 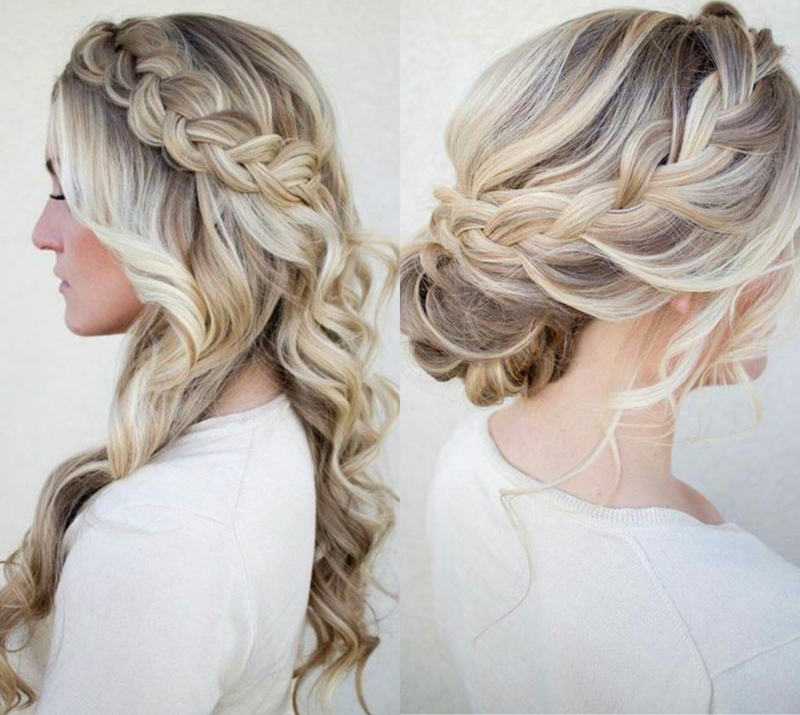 Oh how we are loving the braid trend. Braids have truly taken over 2016 with a storm. They are being incorporated in everything you can think of. And bridal hair is no exception. We are expecting to see a more mystical look when it comes to braids. Not only will the braids be more low key but they will have accessories in them like Baby’s-breath, jewels and flowers of all kinds. 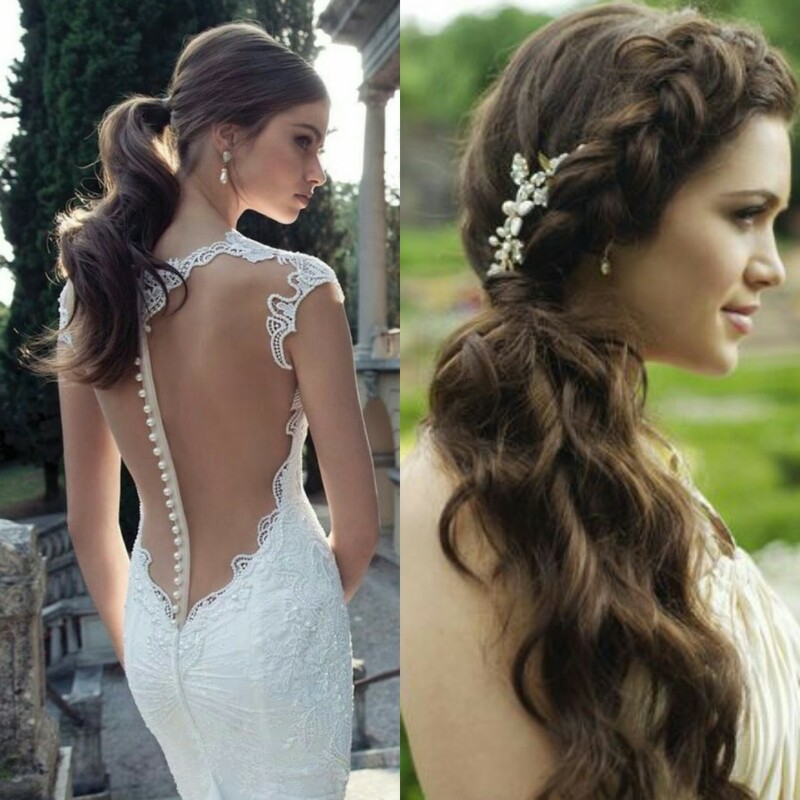 The great part about incorporating a braid in your hair for your special day is you have so much versatility. You can have a full braided updo, or you can choose to incorporate a braid in your hair with waves the options are endless. They can be transformed into so many styles they go with every wedding theme you can imagine. If flower crowns were the trend for 2015 then floral accessories are the trend for 2016. Flowers have always been a big part of weddings regardless of the theme there are always flowers incorporated somewhere. 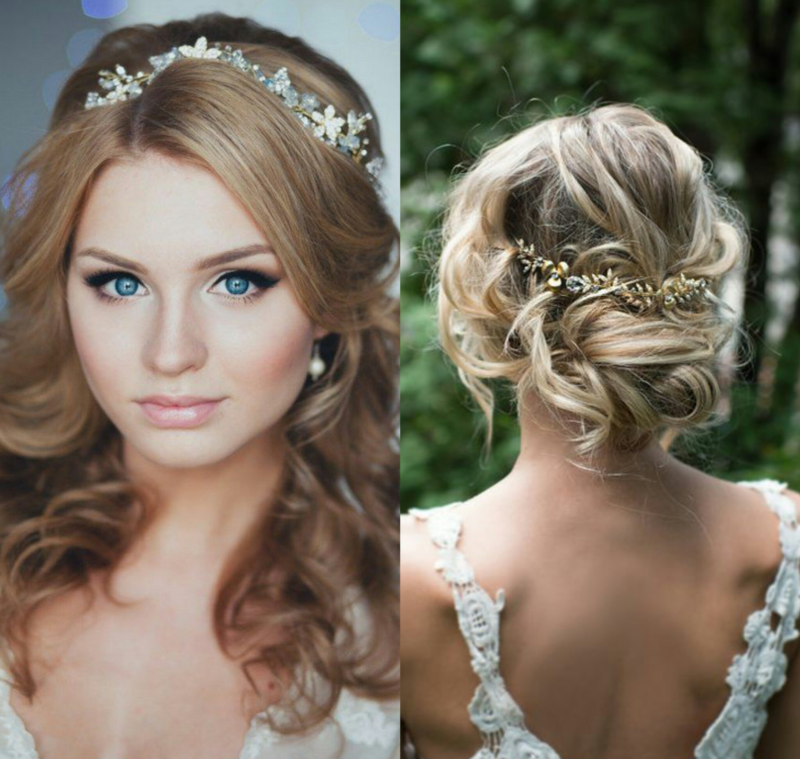 However, this year they are coming in a big way when it comes to incorporating them into bridal hair styles. Since veils are not as big anymore in bridal gowns many brides are choosing to use flowers in their hair instead. Or they are using them to accessorize their veil. 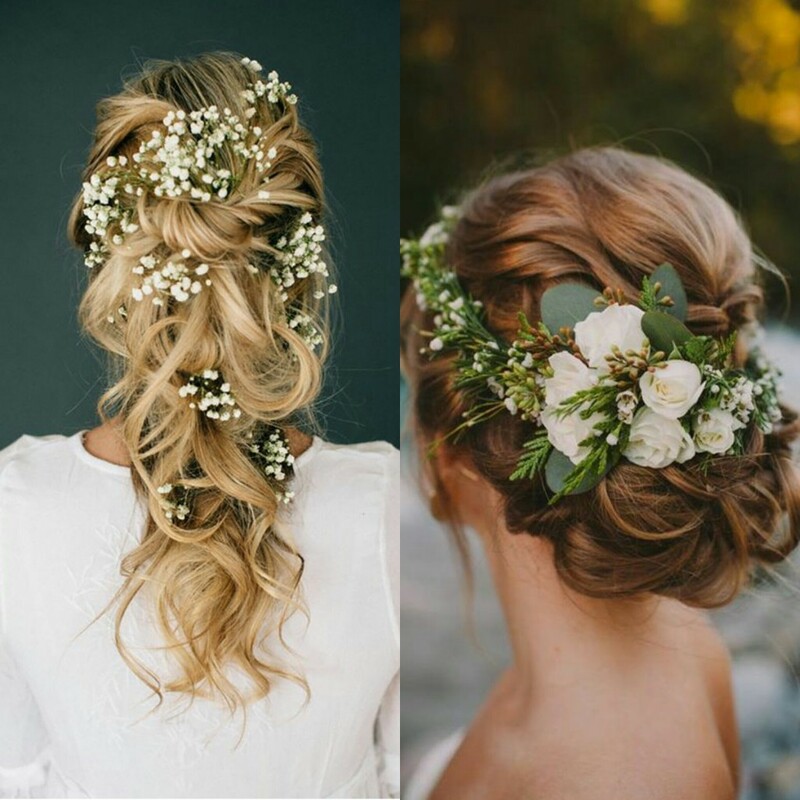 Not only that but flowers are also being used as part of the hair such as in an updo, a loose wave or even in a braid. Since veils have become less popular, headbands have become the modern form of a veil. It adds a little touch of sparkle to your hair and it can be integrated with almost any hair style. You can wear your hair up and have a beautiful headband or you can wear your hair down. Headbands also come in different shapes and sizes so you can choose whichever works best for you. It is important to remember that all though headbands are not as traditional they can also be incorporated into your veil if you choose to do that as well. Having your hair half up & half down has always been a bridal hairstyle. However, now it is getting a bit of an upgrade by incorporating all the trends in one. When you choose to have your hair half up & half down you can incorporate flowers, a beautiful veil, a headband or even curls. With this hair style you get to choose exactly what you want and how you want it. This bridal hairstyle has become such a huge trend because you get to have your hair up and out of your face. If you are a bride that is considering the ponytail trend as your hairstyle but think it is too casual you can always choose this trend. As it is less low-key and casual while still being effortless and beautiful. We get it. Looking through multiple bridal magazines and Pinterest boards can be overwhelming especially when you are looking for something specific and don’t find it. 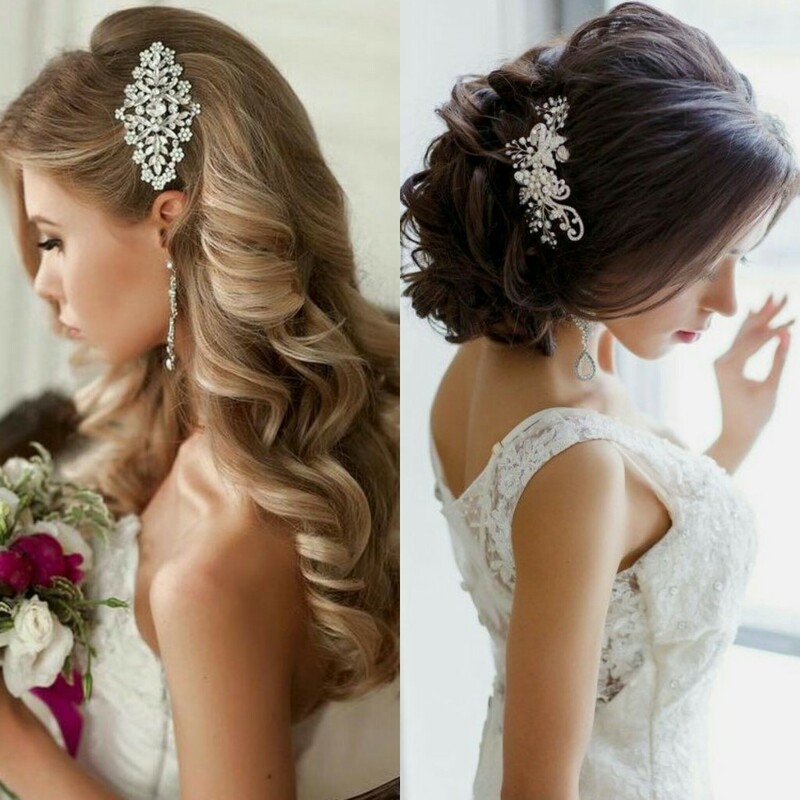 We are here to tell you that if you cannot decide what to do with your hair on your special day you can have the perfect look with a hair clip. You read that correctly hair clips are coming in a big way as you can build-up on them and have more than one or just one. The beauty of using hair clips is you get to incorporate your wedding theme and colors as they come in multiple sizes, shapes and forms. Let’s not forget they also work well with all hair lengths from a pixie cut to the longest length. The versatility and laid back factor in hair clips is what makes it such a huge trend for 2016. Choosing your hairstyle for your wedding can be a tedious task as you want to look your very best while still having a style that will go well with the theme of your wedding. Next time you are looking for bridal hairstyles to take to your hairstylist show them one of these. 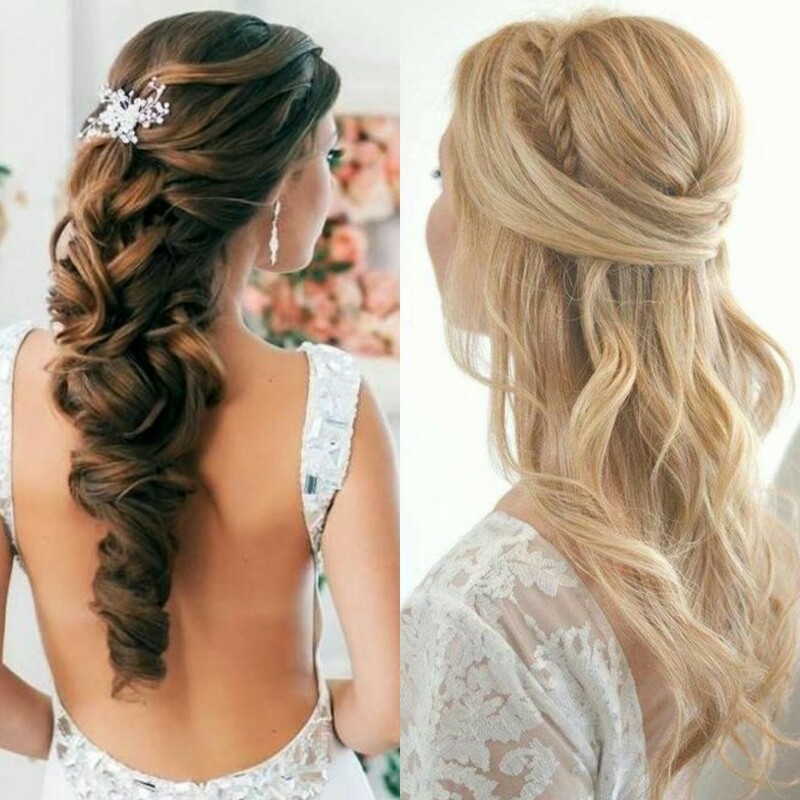 Please let us know in the comments below which trending bridal hairstyle is your favorite.